Mortimer Adler wrote this book in 1940. He updated it in the 70’s. It’s still a classic. Get past the fact that he refers to all readers and students of books as men. You can read, so what can you learn from a book like this? Ever put down a book because it was “too hard”? 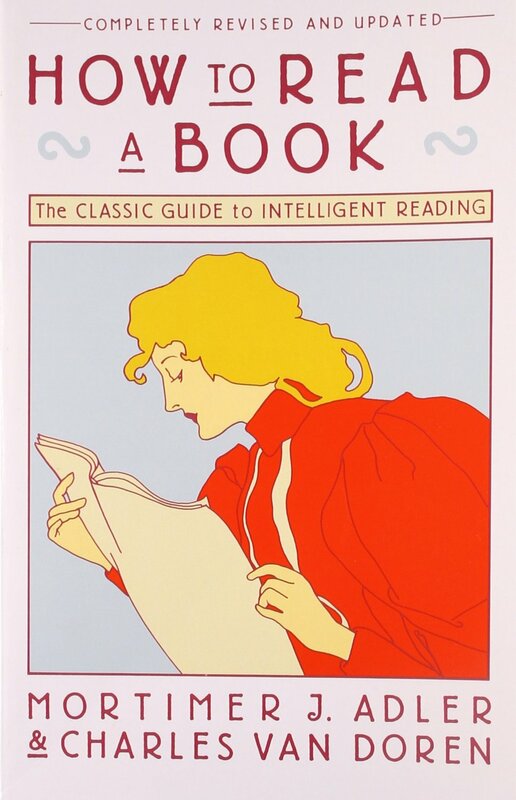 In a series of lessons on how to read a book, Adler takes us from being simplistic children who can read simple things, to adults who can read anything we want to. Adler was a philosopher and educator and instrumental in starting the Great Books program. I have a set that I bought at a pittance at an auction and have all but about 3 volumes. Basically Adler tells us that most of us read at level one (there being four). We are taught in high school only to that level. It’s basic, reading the words, understanding the form for a job application, reading signs, reading simple newspaper articles and so forth. What Adler calls Level Three reading, or analytical, is really what we today call critical reading skills. It means we understand fairly completely what the author was trying to convey. It presumes we know what she set out to tell us, and what are her main arguments. Only then are we in any position to criticize the work, either agreeing or disagreeing. If we can’t verbally relate what these things, we have nothing more than a worthless opinion. Enough said. Level Four reading is where we compare authors on a similar topic, gleaning the various arguments pro and con and arriving at a framing of the issues they attached. It is presumably what grad students and others do who are researching a topic, learning what everyone has to say, and then perhaps formulating our own synthesis. The rules for learning to move along this ladder of reading are invaluable it seems to me. For instance we must read all the introductory material, the jacket, the table of contents. Before we even start we can have a clear understanding of what this book proposes. Only then can we know what are essential points in the material as we read, and begin the process of determining whether the author has fulfilled their goal in giving us valid arguments to sustain his or her position. Such reading is active, intense, and difficult. It requires real attention. But if you have ever read a book only to have little idea “what the book said” after finishing it, well, you will benefit from the exercises. All too often we just give up and read the words, thankful at least that we can say “we read Proust” even though we digested none of it. And according to Adler, any person of average intelligence should be able to get through most any book. Much is made of science books, philosophy books, and so forth. These are difficult no doubt, but if we learn the terms the author uses, any special definitions she uses, then we can make sense of most any work. To the degree that we cannot, it may say more about the author’s failure to write clearly than our inability to untangle awkward sentences. There are exercises at the end, where you are given writings to read and then answer questions about. You will know quickly whether you are reading in a new and better way. Not all reading is of course difficult and slow. Adler points out that books that are simplistic and perhaps of no great value can be read swiftly, almost skimmed for whatever might be of value. Others are not so difficult as so filled with offerings that several readings may occur over a lifetime to get the full value. Dante’s Inferno would come to mind. Of course, we can use reading aids such as reviews, and condensations or explanations of great works but Adler tells us that these should be used after the fact, not before. If like I, you have read Aristotle and known you were only getting a superficial understanding, then you may want to tackle it again. A point not necessarily made by Adler but which I think is fairly useful, is, as least as it relates to “classics”, the use of biographical sketches of the author before you begin the book. It helps I find, to understand a bit more about the author when attempting to envision what he attempted to set out in his work. A list of books worth reading (admittedly Western in orientation) is also included. Many of them you no doubt will be familiar with. But in a world where we always have time to add to our book lists, who can turn down that? Read this and I think you will be surprised at the useful tips it provides. God knows the world could use a few more critical readers and thinkers. We unfortunately inhabit a world where sound-bytes predominate and along with “memes” provide much that is not even close to being worth hearing or reading or true.